I've neglected my blog a bit, not a good start. To make up for it I'm going to tell you all about my night out at Monte Casino. So my friend, who most of you will know as THE twitter queen @punkystarfish was invited to Monte to experience a night of what they do best. I tagged along as her 'date' for the night and we both had an excellent time. 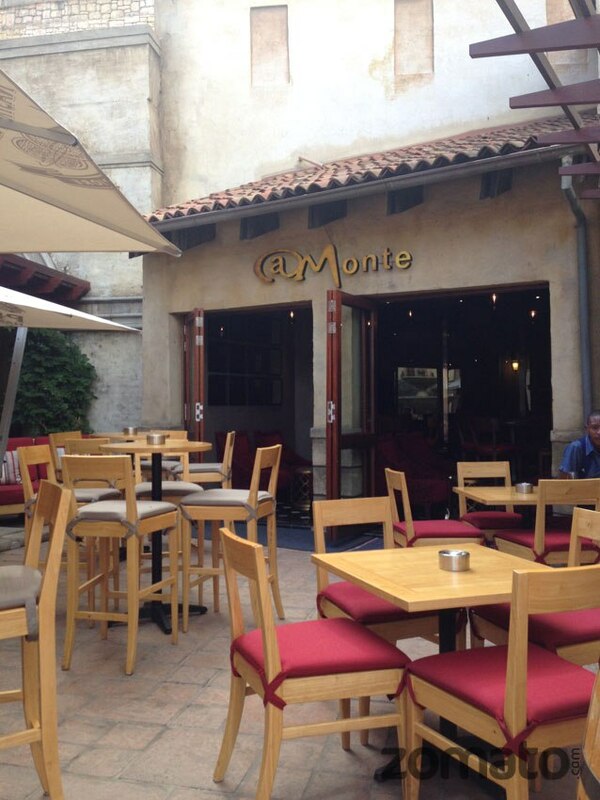 First stop was dinner @Monte which is outside in the Piazza area. It has a very relaxed 'after work' light meal and drinks vibe, perfect for pre-show dinners or just a a night out with friends. Very scrumptious indeed!! Unfortunately being on Paleo meant I couldn't indulge in all of the deliciousness but I would be lying if I didn't admit that a little bit of fudge and honeycomb found it's way into my mouth. I just couldn't resist! The staff were excellent, very friendly and efficient which is often hard to find. After we filled our stomachs we were take through to the casino to try our hands at roulette. As a first time gambler I had lots of fun and didn't do too shabby. We were given about R120 worth of chips and after 3 rounds I had won R670. The most won was about R7000 which is a pretty decent amount to make in a couple of minutes. I'm not promoting gambling here but when they say 'Everyone is a winner at Monte" I'm starting to believe them. Whether you win or not the thrill is always in the game and we just had a great time trying our luck. Lastly we were invited to watch Andre the Hilarious Hypnotist.This was the highlight of the night for me. What an absolutely fantastic show! We were lucky enough to have the company of the Mr South Africa finalists in the audience and some of them volunteered to take part in the show. Andre made them do everything from a Beyonce routine to a the more traditional 'cluck like a chicken'. It was fantastically funny whilst giving us an interesting insight into how the brain works. One of the Mr SA finalists was told to pretend he was in the full monty. We couldn't control our laughter as he fully embodied a confident stripper and began thrusting and unbuttoning his shirt. Next he RIPPED his vest off and Andre had to stop him before he got too carried away. Poor guy is going to be very confused in the morning when he finds his vest in shreds! He will be performing at Monet until the 9th of March and I would highly recommend going to see him! To some up, we all had a good night. Monte itself is beautiful and as many times as I've been there I still see something new every time I go. There's a number of restaurants, shops, entertainment options and of course the casino. The fact that it has all of these things makes it it perfect for a night out where, like us, you can start with dinner and enjoy some entertainment afterwards. Thank-you Monte Casino for a spectacular night. I look forward to many more!